The artwork for the Release "Time Fades Away" Petition page has recently been updated and looks fantastic. 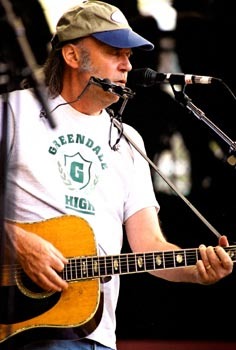 Jef, over at Sidestreet Records, has been very generous in redesigning the page and offering up lots of rare Neil Young artwork. Many thanks Jef! And speaking of the petition, we crossed the 2,000 signature level last week. A footnote on the TFA petition relative to the On The Beach Petition. It took approximately one year for the OTB petition to cross the 2,000 signature mark between June 2000 and May 2001 -- something TFA has achieved in less than 3 months! On another sidenote, a reader emailed Thrasher the story of the Fiona Apple fans petitioning for the release of the "Extraordinary Machine" album. Now this is an interesting story in and of itself full of charges and counter-charges. Thus far, the Fiona Apple petition has gathered over 32,000 signatures. The Free Fiona website features extensive information on the fans' campaign, including event calendars, donation links, and even a gift shop for t-shirts and hats?! All Thrasher can say is, "And I thought I didn't have a life..."
Meanwhile, the signatures continue to roll in for our little effort to Free TFA. "I guess the closest comment to my heart is that I can think of only two other recordings that stand so far apart from - literally - everything else, those being "Tonight's the Night" and the 5 cd bootleg collection of Dylan's "The Genuine Basement Tapes", music that expresses feelings that most other artists can't imagine in their deepest dreams, I have a vinyl copy, of course, and when do I get to listen to that? "Time Fades Away" is meant to be listened to alone or with a tight friend. Like in my car. Please do this, I'm 53 and I feel like ten years have fallen on my head in the last one, don't wait... "cause you know how time fades away." "
This is one your top artistic statements ever. Please release it. Art is about pain sometimes, and this is as raw a statement on that subject as I've ever seen." Don't let the money go to the bootleggers. You can direct the moneyflow from this cd to the charity. Thanks and get well soon!!" 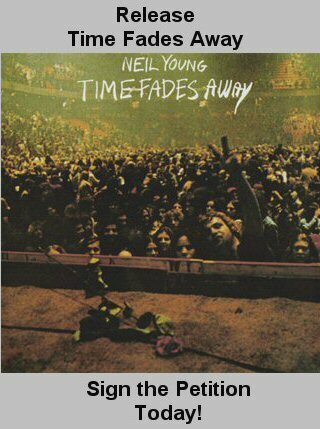 " "Time Fades Away" is a necessary complement to "Tonight's the Night". Don't Be Denied, World on a String, and Borrowed Tune are cut from the same piece of cloth. Both albums need to released to help define and give depth and meaning to the other. These two were my favorite NY albums but are now gone." "I'm 47 years old. 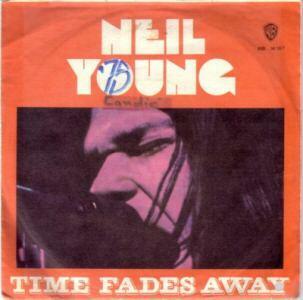 I've listened to Time Fades Away since I bought a copy in the late 70s. Though my life has evolved and I've changed, my appreciation for this collection of songs has not diminished. The music is great, the messages within the songs is real, and the memories it provokes are genuine. Despite its perceived imperfections, there are a lot of people would simply like to add Time Fades Away to their CD collection." "Our man Neil, the epitome of integrity and articulate artistic expression...you know. Anyway, C'mon Reprise Records. We won't burn out, rust, or fade away in our dedication or respect for our inspiring friend. 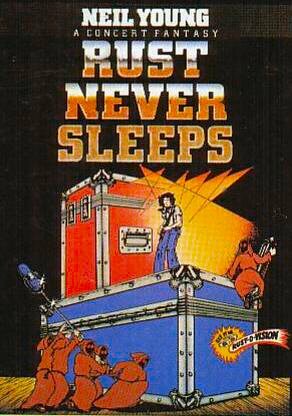 (if it's not too much to ask, that cool orange "Reprise Records" label would be a nice touch in your soon to be released CD of Neil Young's "Time Fades Away." Thanks, and hello Neil fans." "Reprise has a great history of releasing quality music, even in an age of total sell-out commercialism, you all have stayed within limits and seem to, even when you stray, come back to the fold of keeping some art & higher purpose in music, so thanks... Please continue that legacy by releasing this record... Maybe you can add media from Neil that hasn't & cannot be touched by the bootleggers who have been forced to release this record to Neil's fans out of their love for Neil's contributions to our rock-n-roll, which we will not let die, although it may get far into 'the black' we disciples will always pull it back into the light... As long as we have 3 chords, a message, electric guitars & drums, we will fight the death culture & live in ragged glory & not pressure cleaned mediocrity.Fly one, broken arrow. In Love infinite, Eric Haase-creator www.consciousconsumers.net. Doing my best to save what's left of the planet from the humans." "Well, my grandfather listened to neil, my dad still rocks to neil and i soak it all in and love it all. this album is one of the greatest of all times. period!" "Please make my dad [& husband] happy and release this great album!" So if you haven't signed yet, what are you waiting for??? UPDATE: - Album Song Poll & "Don't Be Denied"